Thankful Thursday - Honor Your Calling — Your Creative Connection, Inc.
November 30, 2017 Your Creative Connection, Inc. This one especially resonates with me, and I'm truly thankful to have found it. I love it because I believe I have found, and am honoring my calling, which is to create, teach, and share my love of art with the world. Teaching art to people of all ages (unbelievable but true: I've had students from age 17 months to 103 years old!) and abilities (my work with students on the Autism spectrum and with adults with disabilities is both rewarding and humbling) is the work I am called to do. I am indeed 'most truly alive' when I am helping to nurture and develop a student's innate creativity, or showing them there are "no mess ups in art," or quietly marveling over a just-completed class where artful magic happened. There is no greater gift than knowing what you do makes a positive impact on another person's life, and when you can actually witness the effect you've had firsthand, well, that's a rare and wonderful bonus! 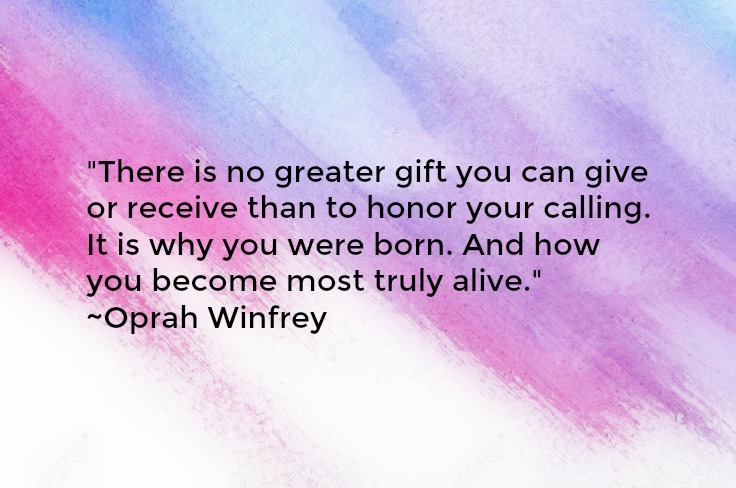 And so, on this Thankful Thursday and every day, my wish is for everyone to find their true calling and to find ways to honor that calling, because Oprah is right: it IS why you were born, and to become fully engaged and truly alive is a wondrous thing!